Shirts With Random Triangles: Arkansas high school where Gus Malzahn began his coaching career names football field in his honor. Arkansas high school where Gus Malzahn began his coaching career names football field in his honor. 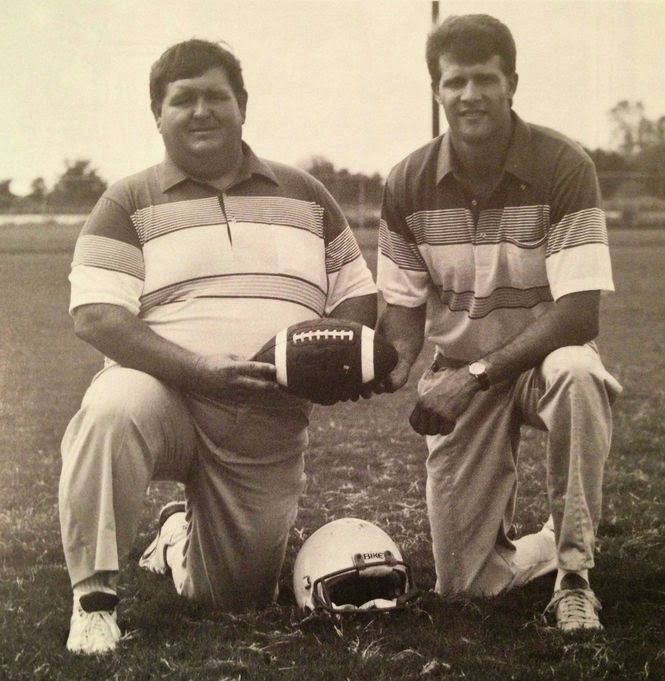 Hugh HS head coach Dale Commer (left) with defensive coordinator Gus Malzahn (right) in 1991. Via al.com. Auburn head football coach Gus Malzahn is being recognized by the Arkansas high school where his coaching career began. Hughes High School in Hughes, Ak. is honoring the Auburn coach on Monday by renaming its football field Malzahn Field in his honor. Malzahn's first coaching job came in 1991, when Hughes hired him as the Blue Devils' defensive coordinator under head coach Dale Commer. Malzahn was promoted to the head coaching job when Commer left a year later. Malzahn took the Hughes to the Arkansas Class AA high school state championship in 1994, where they lost to Lonoke High School. The renaming of Malzahn Field is part of the Hughes' honoring the 20th anniversary of the 1994 team. "That's a pretty special deal," Malzahn said. "Anytime you get a chance to go back and see old friends, and any place that helped you get to where you're at, I think that's very important to try to give back and looking forward to it." Malzahn was head coach at Hughes from 1992 until 1996, when he became head coach of Shiloh Christian in Springdale Ar. Financial issues and lack of participation have resulted in Hughes not fielding a varsity football team since 2011. The school district is hoping to field a junior high team this fall, with a varsity team for the 2016 season.